The partnership proposing to replace the commercial block between the Post Road, Corbin Drive and Interstate 95 say on their new website that it should help, not hurt traffic and parking downtown. David Genovese, president of Baywater Properties (which owns the land, together with developer Penny Glassmeyer’s PG Properties), recently sent a letter to news organizations announcing the new website, www.yourdowntowndarien.com. Impact on Darien schools: “The units are expected to measure 1,500 to 2,000 square feet, and given that there will be no outdoor amenities and that the project is located in downtown Darien, we do not expect young families to purchase or rent the units.” Also, the project is expected to generate significantly more taxes for the town (which spends most of its tax dollars on schools). We are pleased to announce the launch of our website for our Darien project, www.yourdowntowndarien.com. We hope that this site will help residents of Darien get information about our proposal with ease, so that they can read about it, see the images, and study some of the background materials that have formed the basis of our analysis as to why this project as laid out makes sense in Darien. We have already been flooded with calls for support for the project, and we wanted to give residents the opportunity to really study and understand the project. We hope that this makes it easier for all of you who may be asked about it. On the site, residents can download our P&Z presentation video, as well as the presentation itself, and many videos and documents which are important to consider as it relates to parking, public space, and pedestrian flows downtown. Please do not hesitate to reach out if you have any questions or comments, or if you think of any ways in which we might improve the website. Our goal is to encourage the flow of accurate information about our project to the public. 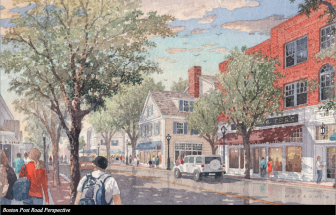 On Wednesday, April 6, 2016 at 7 p.m, David Genovese, founder of Baywater Properties, will present to the public an overview of the downtown Darien redevelopment project proposed by Baywater Properties and its partner, PG Properties. A full presentation of the project will be given to attendees, with significant time available for questions and comments. Commercial Real Estate Developer David Genovese gave a presentation to the public at Town Hall (and on TV79) Thursday evening, providing some updates on his proposal to redevelop the triangle between Corbin Drive, the Post Road and Interstate 95. The proposal doesn't add that much more retail space to the downtown about another 20,000-square feet, Genovese said.